In 2012, Microsoft announced their first powerful tablet computer named Microsoft Surface along with Windows 8 to the market to sharpen its new Windows experience. The Surface Pro/Pro 2 has a desktop-class performance with a 10.6″ screen size along with a sharper 1,920 by 1,080 resolution. They featured a slim designed, adjustable kickstand and detachable keyboard. It also has a better performance by using the Intel Core i5. 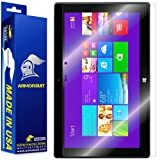 Microsoft Surface Pro 2 Type Cover is the most important accessory that can fulfill the meaning of the versatility of a laptop and tablet. This Type Cover has a larger trackpad with a smooth and more accurate that will make you feel much better when you swipe on it. It also features a backlit key that allows you to work in a dark area. If you are concern more about the battery life of your Surface Pro devices, you should also have a Surface Power Cover along with when you are away from the power source. The Power Cover has an additional 30Wh capacity, so you can work up to 70% more without attaching to the power outlet. To transform your most portable powerful Surface Pro/Pro2 tablet into a desktop PC and can connect to all your favorite hardware and accessories, you will need a docking station. The Surface 2 Docking Station by Microsoft allows you to connect your bigger monitor, wired ethernet network, keyboard, mouse, printers, camera while also charge your Surface Pro/Pro2 and all connected accessories. This Surface Docking Station has 1 x USB 3.0 ports, 3 x USB 2.0 ports, 1 x 10/100 ethernet port, 1 x 3.5mm audio jack and 1 x Mini DisplayPort. By inserting an extra MicroSD, you can expand more storage of your Surface Pro or you can use it for data backup. Surface works with standard microSD card formats including microSD, microSDHC, and microSDXC. This Sandisk MicroSD features a class 10 speed rating as it can support faster data transfer speed up to 80MB/s great for playing 4K videos. This Sandisk MicroSD has a great protection with waterproof, temperature proof, shockproof, X-ray proof and magnet proof. It will add an extra 128 GB of storage to your Surface. Microsoft’s Arc Touch Mouse Surface Edition is a perfect companion for your Surface Pro. It features the same matte black designs and a flat design best for portability. This mouse using Bluetooth 4.0 wireless connectivity that will work seamlessly with your Surface Pro. It uses BlueTrack technology that will almost any surface. It has a unique touch strip that responds precisely to the speed of your finger movement. This Moko slim cover is designed specifically for the Surface Pro/Pro2 device. The cover looks premium, stylish and easy to install and remove. The cover available in many colors and also in genuine leather as well. It also has a built-in stand that allows you to adjust the stand in several angles. This case does not block any ports and buttons. It works perfectly with your Surface Pro Type Cover. The 1o.6 inches on the Surface is so much beautiful. To maintain this beautiful screen for a long last, you will need a strong screen protector. Another great about for this screen protector, if this screen protector becomes scratched or damaged, you can claim a free-of-charge from the manufacturer that located in the USA. The Juiced System multi-functional USB hub is a great look and feels for your Microsoft Surface computer because it is designed specifically for Surface devices. This USB hub’s design is the best fit your Microsoft Surface Pro/Pro2, you just plug it in and it is pretty strong connected and portable for your traveling and working. If you’re looking for more options please check out our Top 5 Best USB Hub for Microsoft Surface Pro Family Reviews. Are you using your Surface Pro / Pro 2 as your main travel machine? This is the original Surface Car Charger from Microsoft for charging Surface Pro/Pro 2 and Surface RT/2. It has a high-quality build and features as an official Surface wall charger. It has the same strong magnet and an additional USB port for charging your favorite device. It can also fast charge your Surface device with a verified power of 3.6A. Surface Pro and Surface Docking use only MiniDisplay port for connecting to the external display. If you have an external display with a different port, you will need an adapter. 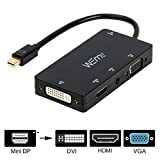 With this WEme adapter allows you to display content on a monitor, HDTV or projectors with DVI, HDMI, and VGA port. 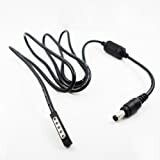 This adapter can output with a max resolution of 1920×1200. It also has an audio out port for connecting to your external speakers too. If you frequently work for a long time at somewhere that doesn’t have a power source for your Surface Pro, It’s a good idea to carry a power bank that can power up your Surface along with you. 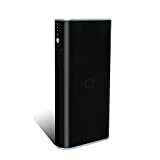 The Qi-infinity power bank features a large 35,000 mAh capacity and 12V and 15V DC output for Surface Pro devices. The surface pro 3 charging cable is already included in this product package. Compatible with Surface Pro/Pro 2 and Surface RT/2. 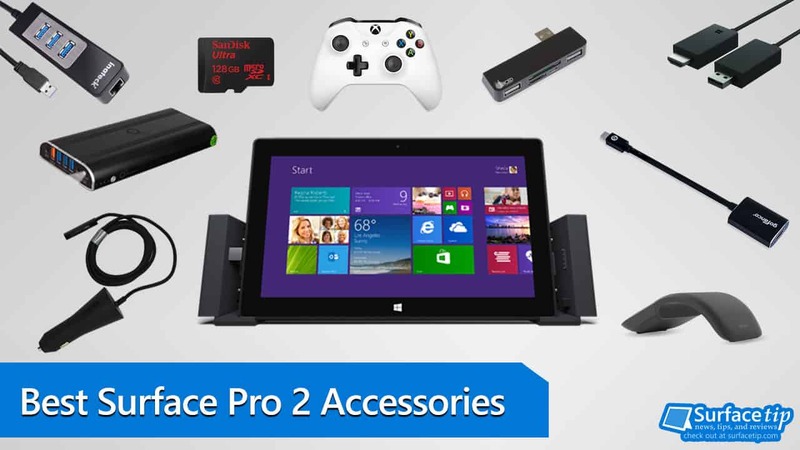 Those are the top 10 must-have accessories for Microsoft Surface Pro/Pro2 so far. With new Type Cover, Surface Docking Station, Surface Mouse, and microSDHC card will significantly increase your Surface Pro performance, storage, and productivity. While case and screen protector will keep your Surface device last longer and still beautiful when you need it. We appreciate hearing your thoughts, questions, and ideas about “Top 10 Must Have Microsoft Surface Pro 1 and Pro 2 Accessories for 2019”. Please post respectful comments and on topic. We will be replying back to you as soon as possible. 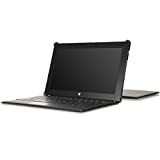 Share your idea about "Top 10 Must Have Microsoft Surface Pro 1 and Pro 2 Accessories for 2019".